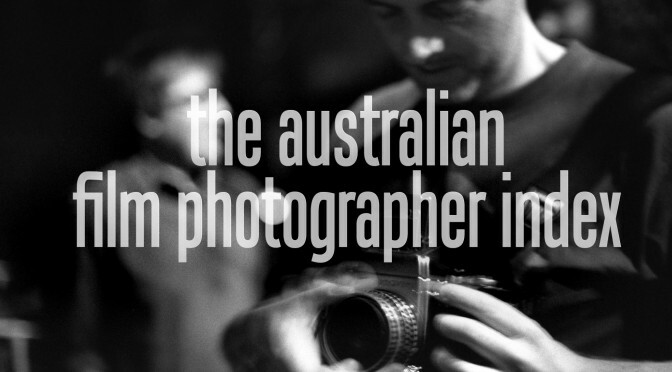 The Australian Film Photographer Index lists portfolio sites, blogs, etc of Australian photographers who continue to work with film. Note: Use the Search bar (right hand corner of table) to filter results with keywords e.g “urban”, “instant”, “35mm” or location “Vic”, “facebook” etc. website Lifestyle, fashion, editorial, still life, architectural. Add me to this list immediately! You are a film photographer. You regularly shoot some kind of film, instant film, alternate process etc. You have a portfolio website which features your film work. A “portfolio” website has a fuzzy definition, but it needs to be a site dedicated to showcasing your own work. You are based in Australia. Yes a “portfolio website” can be a flickr or tumblr or some such… Anything that showcases your film based work. Listing other social media sites along with your portfolio site is positively encouraged. So, If you’d like to add your details to the list or wish to make amendments use the form below or any other known communication method. Location (State)(required) Vic. N.S.W.or A.C.T. W.A. Tas. Qld. S.A. N.T.